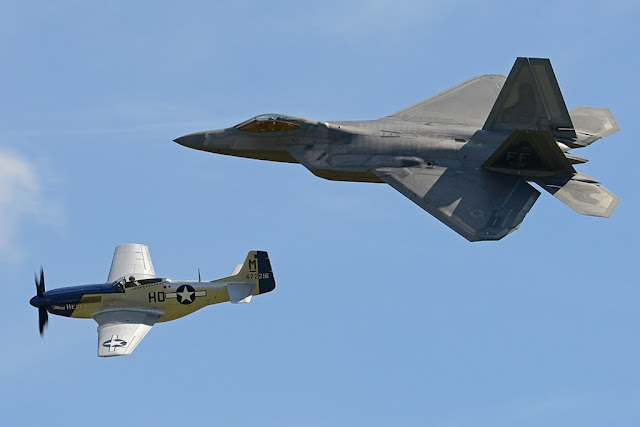 The duo will perform a Heritage Flight during the Royal International Air Tattoo in Fairford, England, July 14-16. The “Berlin Express” P-51B Mustang achieved legendary status in an epic World War II dogfight in Paris in 1944, piloted by American Bill Overstreet, who flew the aircraft under the Eiffel Tower in hot pursuit of a German fighter. Overstreet eventually downed the German plane and eluded heavy enemy fire while escaping the battle with aircraft intact. More than 70 years after this landmark moment, the “Berlin Express” will take to the skies again in honor of the brave airmen who fought against the Axis powers in WWII. Civilian pilot Dan Friedkin, who owns “Berlin Express” and is one of only nine civilian Heritage Flight pilots qualified to fly in formation with U.S. Air Force single-ship demonstration teams, will fly the historic aircraft and perform in the Royal International Air Tattoo in Fairford, England, July 14-16, with the Air Combat Command’s F-22 aerial demonstration team. Before the airshow gets underway, the “Berlin Express” will make a historic transatlantic flight from the U.S. to England with U.S. Air Force Heritage Flight Alumni Lee Lauderback in the cockpit, following the same route it took in 1942 as part of the military troop buildup in the United Kingdom during WW II. The four-day, 5,470-mile journey will begin on June 28 in Texas and be mapped by a SPOT Gen3 tracking device that will transmit the aircraft’s location on a Google Earth map in five-minute intervals. The flight path of the “Berlin Express”, along with photos taken along the way by Lauderback, can be followed on HorsemenFlight.com through its landing in Duxford on July 4. After departing Texas on June 28, Lauderback will pilot the “Berlin Express” to Bangor, Maine, Goose Bay, Canada, Narsarsuaq, Greenland, Keflavik, Iceland and Prestwick, Scotland before arriving at Duxford Airfield. The restored “Berlin Express” is based around the remains of the P-51B 43-24837. This Mustang flew with the 9th Air Force’s 363rd Fighter Group out of RAF Staplehurst in Kent, England. It crashed in Beckley on June 10, 1944 after the pilot was forced to bail out during a training exercise. Sporting a “Malcolm Hood” canopy and wearing the markings for “Berlin Express,” it is dressed exactly like the 357th Fighter Group Mustang which Overstreet famously flew under the Eiffel Tower in 1944.